In the last few days, interested teenagers got to try out, what it is like to study computer science at our university. And like the last years, we offered one of the three projects the pupils could choose from. During this week, they did not just get a look at our daily lifes, but instead got to experience hands on, what it takes to make a robot play soccer. Our new friend Cozmo, a robot produced by Anki, joined us for this years project, and thanks to its intuitive programming environment made it rather easy for the students to solve various problems and to programm and play games with or against Cozmo. Step by step they helped Cozmo to reach his dream goal to become a soccer star player. In contrast to the last years, this time we tried a different learning concept, developed by a master student at our university. In various tasks the 13 children first learned how to work with the robot and his graphical programming environment, before later going on to use a “real” programming language. The main goal was to make Cozmo shoot a goal on friday. Even though this was a challenging task, the students quickly recognized how to use Cozmos sensors to find the ball in the camera image, then calculate the position in the real world, to then figure out where he is supposed to move. Besides working on the project, the pupils were also keen to see our campus, so we showed them around in the labs of TAMS. They got to control a robotic arm with a HoloLense and watch as Trixie searched for interestingly colored objects. The IranOpens are over and everything is back to normal again. Time for us to look back at the last few weeks and draw some conclusions: Many of our modules have been used for the first time and we could gladly see, that most of them worked even better than we expected them to do under real life circumstances. Our new vision and walking algorithms perfectly work together with older modules and brought us some very successful plays. We found and removed many huge and tiny mistakes and bugs, that existed undetected for a long time. The exchange with the other teams broadened our horizont, gave us the possibility to discuss human-league problems, inspired us to new ideas and let us make new friends. 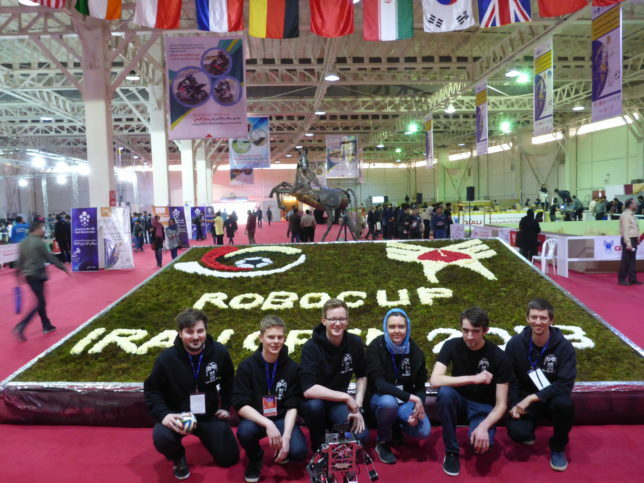 Last but not least, this years IranOpen was the first chance for three of our members to experience working at a RoboCup competition. Of course, we also realized what doesn’t work that well yet and we are working on fixing these problems as soon as possible. 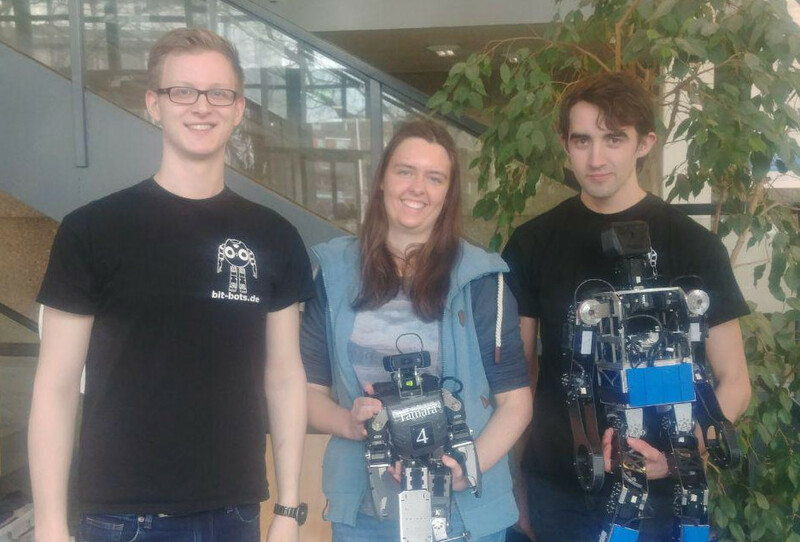 We are mainly focusing on getting our new robots to work, so that we can run four robots at the same time for the world championship, which draws nearer and nearer. We are looking forward to see our robots score some goals. All in all the competition was a huge success and lets us confidently work towards the world championship. Our last day started as chaotically as we already anticipated it to be: 10 minutes before our semifinals-game was supposed to start, the exhibition halls doors were still locked. As the referees and the TC didn’t show up on time aswell, luckily we still had enough time to prepare. Playing against Rhoban was a challenge, as always, but with our vision working perfectly and optimized walking algorithms we did pretty good. A few minutes before the game was over chaos took over once again: Due to unknown reasons the power was cut and therefor all game events stored in the Gamecontroller were lost. The referees and the TC took some time to deliberate about what to do now and then decided to continue the game anyways. In the end Rhoban beat us, leaving us on the third place out of eight competitors. The first place goes to MRL-HSL. After the games were over, we had some time to visit a temple with some members of Rhoban and ZJUDancer, and to show them around on the bazaar. The rest of the day was used to attend the very exciting closing ceremony. After the banquette, where we could once again talk and joke with our – sometimes long known, sometimes new – friends, it was already time to say goodbye. 13 hours of flight later, completely exhausted but very very happy, Hamburg had us back. We won’t have much time to rest on our success, though. The world championship is getting closer and today the lab was as crowded as always again. Today began as early as the days before. Our first game against MRL-HSL was scheduled for 8:30 AM. Until then we still had to fix some hardware components. As we were working on our code until late in the night, one could see our exhaustion in our faces. Nonetheless we played a good game, which, unfortunately ended in a loss, but proved that our hard work during the last days was a success. Our robots fell very badly during the game, damaging parts of our hardware beyond repair and causing major problems during our second game. Therefor Frankenbot now inherited Minibots arm aswell, making him more and more a patchwork-beast. Between the other teams, Frankenbot made himself a name as “Killer” or “Terminator” and is well known. Because there is one thing we could prove during the last days: We are very good at not getting tipped over. In our free time after the games we went out to explore Teheran. We bought lots of food, spices and sweets at the bazaar and visited a mosque nearby. During our third game the hardware problems lingered. By now everything seems to be working again and we hope, our robots won’t get hurt again tomorrow. After the games we had some time to talk to the other teams. We introduced our ImageTagger to the other teams, Rhoban held an interesting presentation about decisionmaking processes during goalshots and ZJUDancer and MRL-HSL showed a part of their works aswell. We are now making our last preparations for our semifinal-game against Rhoban. We are curious to see the outcome. The first match day is coming to an end. Our enemies being three of the four bestplaced teams in last years world championship, our competition couldn’t be much tighter: We’ve got to face MRL-HSL, Rhoban and ZJUDancer. Especially Rhoban demonstrated clever teamplay and clean goalshots with their three robots and beat all three enemies. The other two teams played very good aswell, leading to many exciting moments. Even though we lost all three of our games today, we made great advances aswell: For the first time since our big hardware modifications we are able to walk long distances again. Our ball recognition works perfectly and huge parts of our behaviour are already functioning normally. Playing against some of the best teams in our league was a good oportunity for us to learn. The knowledge exchange between the teams and the games provide great insights into new tactics and different gamemoves, many of which we are looking forward to try out. The huge amount of games also provides lots of data for our image tagger under realistic conditions. The hardware wasn’t working in our favour today, and so Frankenbot happened to lose a leg – just a few minutes before our last game was about to start. Luckily the damage could be repaired quite easily. Unfortunately we needed one spare part, that we couldn’t replace. So we had to remove it from the other Minibot, which means, that we can only use one of them for the rest of the competition. At least we can focus our work on that one now. We are now working on fixing the behaviour completely and optimizing some parts, in order to get better results in our next games. With loads of luggage and close to no sleep we finally arrived in Teheran. We didn’t get much time to rest, because just two hours after the arrival at our hotel we had to depart to the venue and begin with the setup. Everything seems to be a bit more organized in comparison to our experiences in the last years. Just a few hours later we actually had power and internet access, and we could begin our preparations. Lucky for us, as there were lots of things to be done: Besides having to prepare our two Minibots, this year for the first time we bring two new participants to the IranOpen. While we expect the two new robots, produced by the WF Wolves, to improve our performance, the new platform also brings some new difficulties with it. By now the damages caused by the flight are fixed and our software is on a good way to be up and running by tomorrow morning. Our robots have been measured and this year we also got a (very brief) referee training. We will now use the rest of the day to keep working on our software, so that we will be ready for our first game tomorrow at 8:30 AM. We can’t wait to see what the following days will bring. On tuesday, the 20th of February, the annual University Day took place at the UHH. While we couldn’t participate last year, due to the foyers being closed down, this year we could demonstrate our robots and inspire young students to study a computer sience related topic. Interested students had the chance to steer a robot themselves. Even though Tamara (one of our Darwin-OP robots) usually works autonomously and makes her own decisions, this time we decided to put a leash on, or rather a controller. The new semester has begun and with it our preparations for next year’s contests. Even though our reportings on this site came to a full stop after we dropped out of the world championship, we kept conversing and interchanging with other teams. Our presentation about the new ROS-architecture during the symposium also was a great success. After a short recreation-phase in the summer, we went back to our normal shedule by September. Our first project in the new semester was a cooperation with the “Gymnasium Walddörfer”, a secondary school in Volksdorf. Together, we hosted a school project week for students in the IT-profile and let them have a peek into the field of robotics. In October we prepared a part of the trial studies, where prospective students could try out studying in computer science during their holidays. 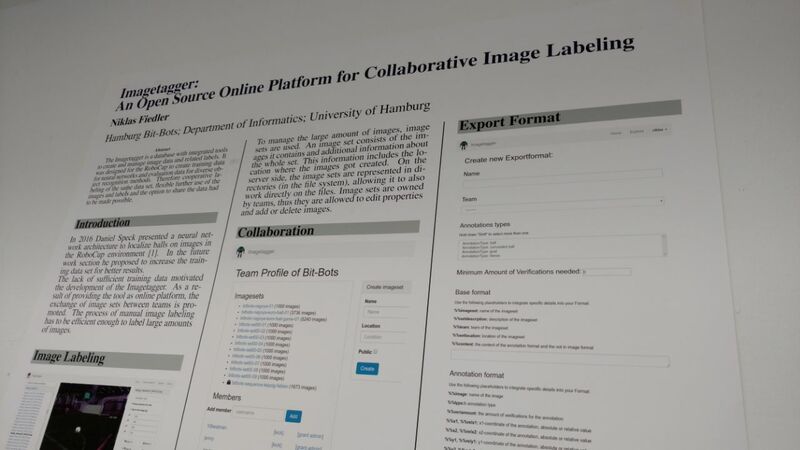 During the same week we presented two of our projects at the “Informatik-Expo”: The new ROS-architecture in our league and the ImageTagger, a tool for labeling images. We also participated in the “lange Nacht des Wissens” again, this year at a panel discussion of the legal studies faculty. In December we will visit Bordeaux for a weekend to take part in the 5th international Humanoid Soccer School, hosted by team RHOBAN, the current world champion in our league. We’re happily looking forward to an lively exchange.